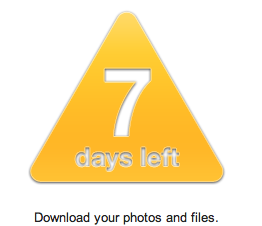 If you’re like the rest of us, Apple has been inundating you with this count-down to the end of MobileMe and how you only have X days left to “Download your photos and files.” I can’t tell you how many phone calls I’m getting about this and I’m here to put your mind at ease. Second — Let’s say you did use MobileMe as a photo-sharing tool. This warning from Apple is only relevant if you deleted all of your MobileMe-shared photos from your own computer/back up drives, or if they’re on someone else’s computer that is now unaccessible to you. I.e. If you’ve got the photos already in your system, you don’t need to sweat this (be sure to check, though, just to be positive). Now, some of you may or may not have noticed that Apple has chosen to exclude this photo-sharing functionality in iCloud. This is likely because much of our photo-sharing is now done on Facebook and other platforms. When MobileMe and its precursor, .mac, were created, Facebook was not the photo-sharing tool it is today. You .mac folks, the ones who have been around the longest, are likely the only people who need to do any photo downloading from MobileMe at this time, in fact. -I’ve got a webinar coming up on July 10th at 11AM PST. I’ll be discussing how to unleash Siri to her fullest capacity; you don’t want to miss out. -In the next week you can expect to hear about what to expect with the new OS, Mountain Lion. Stay tuned for that post and ensuing discussion. Till next time — MacWhisperer out.